"The knowledge, skills, and behaviors essential to high school graduates to be prepared to enter college and the workforce and compete in the global economy including content knowledge, learning and behavior skills." Colorado allows students to earn dual credit in academic and/or CTE courses through concurrent enrollment (Grades 9–12) and ASCENT, or accelerating students through concurrent enrollment (for students who have completed Grade 12) at their high school, postsecondary institution, or online. Students may take developmental/remedial coursework for dual credit. Public postsecondary institutions are required to accept these credits within certain guidelines (Education Commission of the States, 2015). The Gateway to College National Network has partnered with institutions of higher education in Colorado to provide two early college high schools as part of the Early College High School Initiative (ECHSI), and the Middle College National Consortium and the National Council of La Raza have partnered with institutions of higher education to each provide one early college high school program as part of the ECHSI. Colorado has adopted the National Career Clusters Framework and has modified the 17 Career Clusters to the needs of the state’s workforce and businesses (NASDCTEc, n.d.). Transportation, Distribution, and Logistics (Colorado Community College System, 2010). For more information about programs of study in Colorado, visit the Colorado Career & Technical Education website. National Association of State Directors of Career Technical Education Consortium (NASDCTEc). (n.d.). 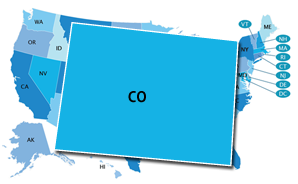 Colorado [Interactive map of state CTE profiles]. In 2010, Colorado mandated that all students in Grades 9–12 have an Individual Career and Academic Plan (ICAP). (U.S. Department of Labor, 2013). The ICAP should include students’ courses needed to meet graduation requirements; intended participation in programs such as concurrent enrollment or CTE, goals related to postsecondary and career aspirations, career exploration, financial literacy and planning; and consideration of how family, community, and culture impact students’ plans. Each student’s ICAP is kept with their records and made accessible to educators, students, parents and/or legal guardians. It must be consistently updated with documentation or modified goals (Colorado Department of Education, n.d.; Colorado State Plan, n.d.). State statute (§22-2-106) required the State Board of Education to adopt a set of guidelines for high school graduation by May 2013. Districts have the 2013–14 school year to adopt local graduation requirements that meet or exceed minimum standards or competency-based standards adopted by the State Board. Districts will then begin implementing their requirements with the ninth grade class of 2014–15 for graduation in 2018. Specific course requirements vary depending on the college or school within the university to which the student applies. Colorado may have a state-specific Early Warning System, but the system is not publicly available.